North Korean Ambassador to the U.K. Hyon Hak-bong has been ordered to return to Pyongyang after the embassy's No. 2 diplomat defected to South Korea, sources said Tuesday. 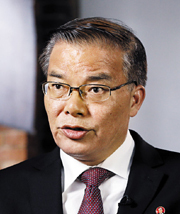 Hyon is being interrogated by North Korean security officials about the events leading up to Thae Yong-ho's defection and is expected to return to Pyongyang in October. Diplomatic sources in London believe Hyon is being blamed for the defection. Hyon previously served in the North's mission at the UN and has been ambassador to the U.K. since late 2011.